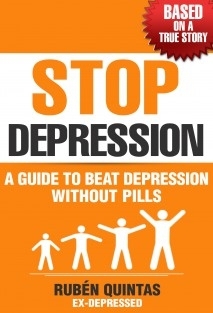 Stop Depression shows in a simple step-by-step way how to overcome depression without medication. You will regain your zest for life thanks to the practical advice and the techniques it describes. Its teachings are helping thousands of people overcome depression. “It is a book created pure and simply to help people who are going through the same I experienced some time ago. The book starts by telling readers my story and later it asks a question that for me is fundamental: Are you sad or depressed? A short rating scale follows to measure your level of depression. • My diary, written while I was depressed. • Practical exercises I used to overcome depression. And, finally, there is a list of recommended resources I found very useful. If you follow the recommendations of Stop Depression to the letter you will discover how to overcome depression without medication. «It helped me a lot; I had been severely depressed for many years, and I’ve finally managed to overcome my depression. Our minds are truly strong and with this book and its easy exercises you will succeed». Manuel. 36, Mendoza (Argentina).